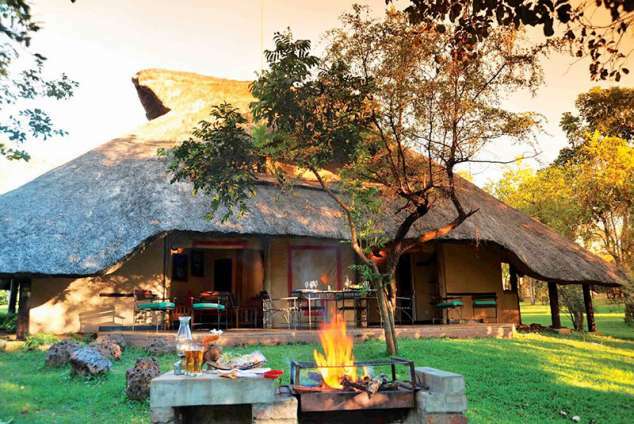 Lokuthula Lodges - Victoria Falls Accommodation. Located on the grounds of the Victoria Falls Safari Lodge Resort are 31 rustic, timeshare self-catering units known as Lokuthula Lodges. Some of these units may be booked on a Bed and Breakfast basis. Situated on the Victoria Falls Safari Lodge property, 24kms from Victoria Falls Airport, it is surrounded by 80,000 hectares of unspoilt African bush and borders the unfenced Zambezi National Park. A nearby waterhole facilitates the free movement of game between the park and the lodges and the resort’s resident warthogs and bushbuck will be a delight. The comfortably furnished lodges are split-level and open fronted with blinds, affording magnificent views of unspoilt bushveld. All lodges have fans, mosquito nets and a range of customised hotel toiletries. • Breakfast for Lokuthula Lodges B & B guests is served at MaKuwa-Kuwa Restaurant at Victoria Falls Safari Lodge between 06:30hrs-10:00hrs daily. • Light snacks and lunches are served at MaKuwa-Kuwa Restaurant, Buffalo Bar and The Boma Poolside Bar (not included in the rate). • Dinners are served at MaKuwa-Kuwa Restaurant and The Boma Dinner & Drum Show (not included in rate). • Activities Desk available at main hotel to plan and book excursions around the region. • Same day laundry service (not included in rate). • Baby sitting facilities on request. • A three tier swimming pool with children’s pool located next to The Boma Dinner & Drum Show. • Internet lounge situated at Victoria Falls Safari Lodge. • The resort provides 24-hour security. • TV lounge available at Victoria Falls Safari Lodge. • All lodges have a lock-up safety deposit boxes (available of payment of a key deposit). • Curio Shop situated at Victoria Falls Safari Lodge. • A children’s playground, trampoline & volleyball court. • All lodges have direct dial telephones. • Complimentary hourly shuttle bus to the village, markets and Victoria Falls Rainforest. • Complimentary evening shuttle to The Boma Dinner & Drum Show available on request. • Check out time 10:00hrs / Check in time 14:00hrs. • Credit cards accepted: VISA, Amex and MasterCard. Resort activities on offer consist of hide sits, guided walks and nature trails. Additional activities may be booked at the in-house Activities Desk including white water rafting, canoeing, helicopter flights over the Victoria Falls, game drives, elephant interaction, sunset cruises, and gorge swings. Guests may use the lodge’s complimentary shuttle bus to visit the Victoria Falls Rainforest. The ‘Vulture Culture Experience’ occurs daily at 13:00hrs, below the Buffalo Bar viewing deck (duration is approx 30 minutes). This is a conservation exercise to help maintain the local vulture populations, providing guests with a thrilling insight into the lives of these raptors. 436 page views since 26 Mar, 2018. Last updated on 27 Mar, 2018.